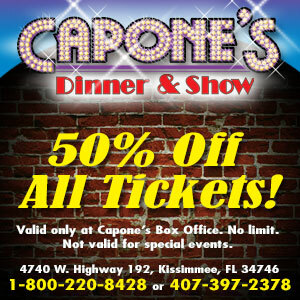 Capone’s Dinner & Show – It’s a Blast from the Past! Box office is open from 9:00 a.m. to 10:00 p.m. Typically 7:30 p.m., but call to confirm – showtime has seasonal changes and 2-show nights are possible. Children 3 years and under are free! Parties of 10 or more there will be a partial gratuity collected at check-in. 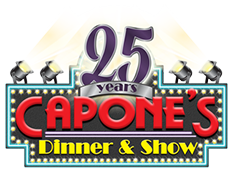 Follow the wise guys and clever gals at Capone's Dinner & Show - advice you can't refuse!